Why Control Heat Treatment Temperature? Whether you are through hardening steel, annealing a cold-worked metal, or solution treating an aluminum alloy, the heat treating temperature is critical for obtaining the desired microstructure, and therefore, the desired metal properties. 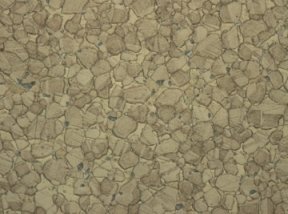 Microstructure refers to such things as the metallurgical phases present in a metal and the grain size. Using a temperature that is too hot can result in a metallurgical transformation that proceeds too quickly or the formation of undesired phases. Using a temperature that is too low can result in incomplete metallurgical transformations, cold worked metals that do not soften sufficiently, or insufficient stress relief. For example, during the through hardening heat treatment of a carbon steel, the steel is heated to transform all the ferrite and cementite to austenite and then quenched to form martensite. If the steel is not heated to a high enough temperature, then there is the risk that all the ferrite and cementite does not transform to austenite. If this occurs, then when the steel is quenched, the remaining ferrite and cementite will be present along with the martensite. These ferrite and pearlite remnants can weaken the steel. Another example is cold-rolled sheet metal that is annealed to improve its ductility, and reduce its strength and hardness. If the annealing temperature is too high, then excessive grain growth will occur. This will result in the metal having lower strength and hardness than intended. Also, if the metal is to be formed, there is the risk of orange peel, a cosmetic defect in heavily formed metals with grains that are too large. So, why might a heat treater use a heat treating temperature that is too high or too low? To save money, to save time, or just sloppy. To reduce energy costs a heat treater might try to run its furnaces at the low end of the required temperature range. However, normal temperature variations throughout a load and normal composition variations within the metal can result in the temperature being too low to cause the desired metallurgical transformations. To save time, a heat treater might operate a furnace at the high end of the specified temperature range to try to move the metallurgical transformations along as fast as possible. Again, with normal temperature and composition variations, the temperature may end up being too high, resulting in excessive or undesired changes in the metal’s microstructure. As for a sloppy heat treater, who knows what you will get from batch to batch of metal stock or components. To learn more about the effects of temperature control on steel microstructure and properties, take our Metallurgy of Steel Heat Treating course or read Practical Heat Treating by J.L. Dorsett and H.E. Boyer or Steels: Processing, Structure,and Performance by George Krauss. Also, the two courses mentioned in the introduction above will discuss the effects of temperature control on precipitation strengthening and annealing cold-worked metals. This entry was posted in General Metallurgy, Heat Treating, Quality improvement and tagged heat treating, ductility, phase transformation, through hardening, steel on June 29, 2014 by mike Pfeifer. The strength of metals is improved by impeding the motion of dislocations through the metals. One approach to achieving this improvement is to form a uniform distribution of closely spaced sub-micron sized particles throughout an alloy. The particles, which are called precipitates, impede dislocation motion through the alloy. Not every alloy can be precipitation strengthened. Alloys that can be precipitation strengthened include Al-Cu, Al-Mg-Si, Cu-Be, and 17-8 PH steel. 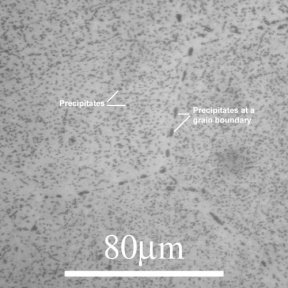 The figure shows precipitates in a Al-Cu alloy. The particles are formed by precipitation, which involves a series of heat treatment steps. The first step is solution heat treatment. This involves heating the alloy up to a temperature that results in the atoms of the alloying element being dissolved within the solid structure formed by the array of atoms of the main element. For Al-Cu alloys, the copper atoms dissolve into the array of aluminum atoms. The dissolved structure is then retained at ambient temperatures by cooling the alloy rapidly, such as by water quenching. After cooling, precipitates are formed either by natural aging or artificial aging. With natural aging, the precipitates form at room temperature. With artificial aging, the precipitates form when an alloy is heated to a temperature lower than the solution heat treatment temperature. Only certain alloys will undergo natural aging. The other alloys must be artificially aged. Regardless of the aging process, as the precipitation process proceeds the precipitates go through a series of stages, with changes in the size, form, and composition of the precipitates. The particular stage of the precipitates has a direct influence on the strength of the alloy. For artificially aged alloys, this is controlled by the aging temperature and time. At any particular aging temperature, there is an aging time at which the alloy will reach its maximum strength. This maximum strength corresponds to a specific stage of the form and composition of the precipitates. Aging for a time that is too short or too long will result in less than maximum alloy strength. For artificially aged alloys, the aging temperature affects the maximum strength that can be obtained, and the time required to reach maximum strength. For naturally aged alloys, the strength increases over time. The time required to reach maximum strength depends on the alloy. Finally, precipitation strengthening can be combined with cold-working to give even greater alloy strength. More information about the metallurgy of precipitation strengthening and precipitation strengthening heat treatment is in our Precipitation Strengthening course. Also, Heat Treatment: Structure and Properties of Nonferrous Alloys by C. R. Brooks, Precipitation Hardening by J.W. Martin, and ASM Handbook, Volume 4: Heat Treating discusses precipitation strengthening. This entry was posted in Aluminum, Copper, Heat Treating, Steel and tagged Aluminum alloys, heat treating, aluminum-copper, phase transformation, precipitation strengthening, aging on June 29, 2014 by mike Pfeifer. In this article, I’m going to take a step back to consider the basic science of metallurgy. On a microscopic level, there are many things going on inside of a metal. Metals consist of numerous microscopic structures that have a direct and large influence on the properties of metals. Through composition, mechanical treatment, and thermal treatment these microscopic structures can be modified to impart specific properties. Whether the desired structures, and resulting properties, are obtained in a completed component or joint between components depends on the knowledge and skill of designers and manufacturers. One set of major structures within a metal are the crystal lattice, grains, and phases. The crystal lattice is the arrangement of the atoms within the metal. Grains are individual crystals within a metal. Figure 1 shows grains in a brass alloy. Phases are different combinations of the elements present in an alloy. Figure 2 shows pearlite in steel. The light colored material is the ferrite phase, which is comprised of iron with a little bit of carbon mixed in. The dark colored phase is cementite, which is comprised of the compound Fe3C. It is also referred to as iron carbide. The properties of a metal are affected by the size of the grains and the phases present. 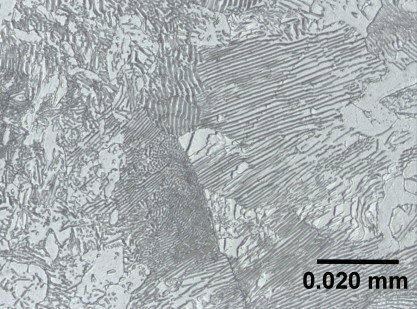 Defects in the metal crystal lattice make it possible to form alloys and deform metals with the metals cracking. These defects are not the same as manufacturing defects such as voids, inclusions, seams, and cracks. Instead, without crystal lattice defects we would only have pure, brittle metals. Various mechanical (e.g. cold rolling) and thermal (e.g. through hardening and precipitation strengthening) processes take advantage of these crystal defects in order to bring about modification of the grains and phases present in a metal, to obtain the desired properties. Also, the number of crystal defects in the metal can be modified to obtain desired properties. For example, cold rolling results in an increase in the number of dislocations in a metal, resulting in increased strength. The, annealing a cold-rolled metal results in a reduction in the number of dislocations and modification of the grains, resulting in a decrease in the metal strength. A common representation of the relationship between properties, composition, microscopic structures, and manufacturing defects is shown in the image below. When the effects of the manufacturing processes on the microscopic structures are properly understood, it is possible to consistently produce metal components and joints that have the desired properties. Essentially, the people in charge of the manufacturing processes are responsible for making sure that during the processes the atoms in metals move to where they need to be. And designers are responsible for specifying where the atoms should be. For more information about the microscopic structures in metals take our online, on-demand Principles of Metallurgy course or read Metallurgy for the Non-Metallurgist, A.C Reardon, editor or Materials Science and Engineering, W.D. Callister. This entry was posted in General Metallurgy, Metallurgy and tagged phases, phase transformation, heat treatment, grains, crystal defects on June 29, 2014 by mike Pfeifer. The metallurgical phases present in an alloy have a huge impact on the properties of a metal component. Phases are distinct materials that are comprised of the elements in the alloy. These distinct materials have distinct properties that have an impact on the overall properties of the entire alloy. Additionally, the size, shape, and location of the phases within the alloy also effect on the overall properties of an alloy. Within many common alloys it is possible to alter the phases present with heat treatment. Forming one or more phases from a different phase is called a phase transformation. Phase transformations occur when in an alloy is heated or during cooling from an elevated temperature. There are several types of phase transformations that can occur when an alloy is cooled from an elevated temperature. The type of transformation that can occur depends on the specific alloy. Not all types of transformations occur in all alloys, and in some alloys no transformations are possible, other than the solid-liquid transformation. Two of the most common phase transformations encountered with common alloys are eutectoid and precipitation. For both types of transformation, the transformation involves the movement of atoms through the metal to rearrange themselves to form the new phase or phases. Ferrite (white) and cementite (dark) in steel. A eutectoid transformation involves a change from a single phase to two other phases when the initial phase is cooled form an elevated temperature. The most common alloy in which this transformation is encountered is steel. The transformation occurs when steel is cooled from the austentizing temperature. During slow to moderate cooling, the austenite transforms to ferrite and cementite. The microstructure consists of cementite plates with ferrite between the plates. This is commonly referred to as pearlite. 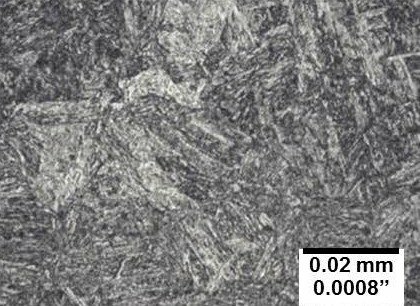 A micrograph of a steel alloy with 0.6% carbon is shown here. forms in the shape of needles or plates and the cementite forms as particles. This structure is referred to as bainite. A micrograph of a steel with bainite is shown in Figure 2. The reverse transformation occurs when steel with ferrite and cementite is heated. When the temperature is high enough, the ferrite and cementite transform to austenite. So, the austenite to ferrite + cementite phase transformation is reversible, and repeatable. Precipitation transformations involve the formation of particles of one phase within an already existing phase. These particles are called precipitates. This transformation occurs when an alloy is cooled from an elevated temperature. At the elevated temperature the phase present consists of the main element in the alloy with the alloying elements in solid solution. When the alloy is cooled the solid solution is not able to hold all the atoms of the alloying elements in solution, so precipitates form that consist of the solute atoms and possibly the atoms of the main element in the alloy. For engineered metal components, precipitation during cooling is undesirable because of the resulting size and location of the precipitates. So, the process is modified by first quenching the alloy to room temperature to suppress the atom motion. Then the alloy is either allowed to transformation at room temperature, if room temperature transformation is possible, or the alloy is reheated to an intermediate temperature to speed up the transformation. An example of a common alloy system in which precipitation is used is the aluminum-copper system. This figure shows a micrograph of Al2Cu precipitates in an aluminum matrix. The precipitation transformation occurs in a number of alloys including aluminum alloys (Al-Cu, Al-Mg-Si, Al-Zn-Mg, and Al-Zn-Mg-Cu), precipitation hardened steels (e.g. 17-4 PH, 15-5 PH, and 13-8), some copper alloys (Cu-Be and Cu-Cr), and Zn-Al alloys. Regardless of the particular transformation, control of the heating temperature, heating time, cooling rate, and, if necessary, reheating temperature and time are all important factors for controlling whether the desired transformation is complete and the shape, size, and location of the phases that form. These in turn have a big impact on the properties of a metal component. The relationship between heat treating process conditions, final microstructure, and properties is discussed in our Metallurgy of Steel, Metallurgy of Steel Heat Treating, and Precipitation Strengthening courses. This entry was posted in Aluminum, General Metallurgy, Metallurgy, Steel and tagged precipitation, phase transformation, heat treatment, eutectoid on June 27, 2014 by mike Pfeifer.